If you like scary movies and all things horror this could be the perfect badge for you. 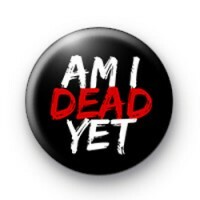 It is a black, white & red pin badge with the text 'Am I Dead Yet' written in a brush font. It has a spooky feel to it and might be appropriate for Halloween.